Home Directory. Tuesday, April 22, 1879. 3,000, a readership that apparently doubled for the summer season. 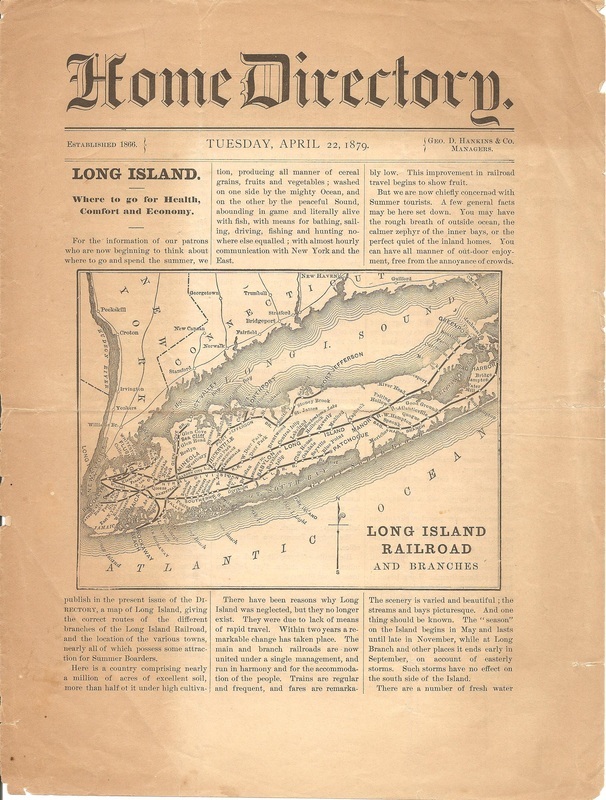 The Directory described Oyster Bay as “one of the finest watering places on the island,” with nearby Cold Spring Harbor proclaimed as “a splendid summer resort.” Both were a stage ride away from the Long Island Railroad station at Syosset. Cold Spring Harbor’s Laurelton Hall boasted steamboat service direct from New York City to the hotel’s wharf. The Oyster Bay Pilot. Oyster Bay, N.Y. Saturday 30 September 1899. Vol VIV, no. 44. This issue features a summary of mealtimes at English country houses. Breakfast at 9:00 consisted of two eggs, half a partridge, three rashers of boiled bacon, a muffin and marmalade, with dressed fish, broiled fowl, omelet, cold ham, and cutlets serving as alternates. Lunch ensued at 1:30, followed in due order by tea at 4:30 and, finally, dinner at 8:30. Page one's sole cut, shown here, illustrates the day's summer and yachting dresses, white being the "prevailing choice." The nameplate employs a display font whose ringlet "O" in Oyster represents the sort of typeface popular in the last decade of the nineteenth century.